Keefer’s Cottage is 135 kilometres from Hobart. Take the A3, Tasman Highway toward Freycinet. At Sorrell turn left at the traffic lights follow the signs to Freycinet National Park. As you approach Swansea, you will pass Kate’s Berry farm, then Wagner’s Cottages. Keefer’s Cottage is located on the right hand side and just passed Francis St. It is well sign posted. The journey takes about one hour and 45-minutes from Hobart city centre and about one hour 30-minutes from Hobart airport. and is well sign posted. If you reach Wagners Cottages, you’ve come too far. The journey takes about one hour 45-minutes from Launceston airport. Keefer’s Cottage is 214 kilometres from Devonport. Take Highway A1 to Launceston and Hobart. Take the B52 to Perth and then rejoin Highway A1 to Campbell Town. At Campbell Town take the B34 to Swansea and the East Coast. Drive through the Swansea township toward Hobart. Keefer’s Cottage is about 1.5 kilometres out of town on your left and is well sign posted. If you reach Wagners Cottages, you’ve come too far. 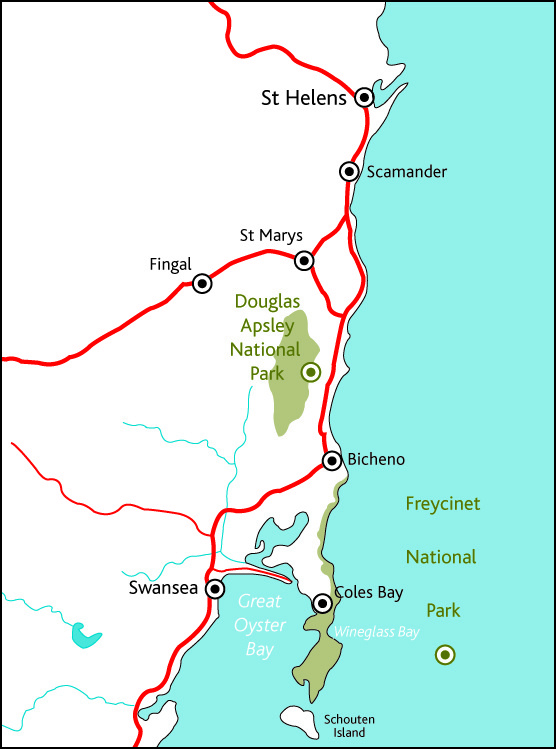 The journey takes about two hours and 30-minutes from Devonport.